Humpty Dumpty sat on a wall. 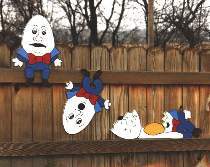 Humpty Dumpty had a great fall! Decorations for your fence or porch railing. The sitting Humpty is approximately 19"H. Cut Humptys from 1/2" plywood. Plan set includes FULL SIZE patterns for all three Humptys shown.